I’ve been trying for a while to come up with an idea for something just perfect for my kiddos’ teacher. She’s super fun and really patient, so I really wanted to give her something that says “I really appreciate how you deal with both my insane-preschoolers regardless of the day”. And then I found out that she digs a good at-home movie. Dudes. She’s getting a Holly Jolly Movie Night Gift Kit from me. Fill a clear gift bag up with loose popcorn kernels. You can alternatively leave the popcorn in the original bags, but we feel it does not give as clean of a look to the finished gift. Place the popcorn bag into the plastic popcorn tub. You can fill the bottom of the tub with tissue paper or shredded basket filler if needed. 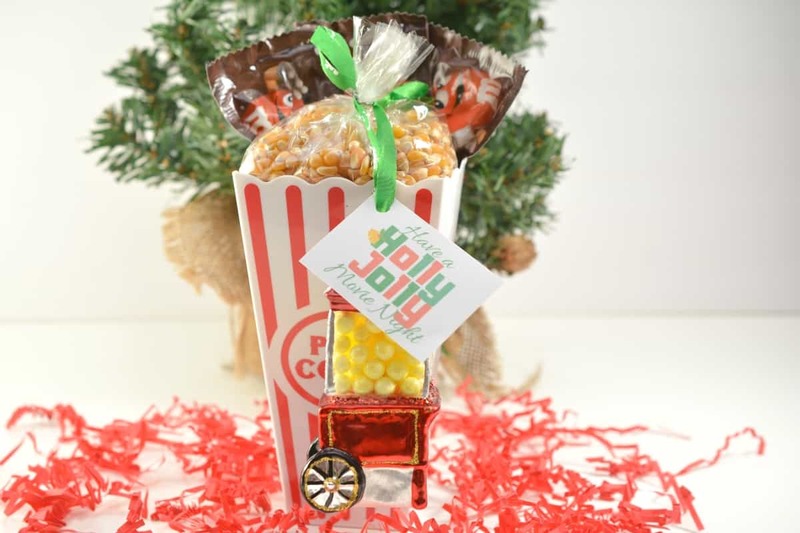 Arrange some fun-size M&M bags around the back of the popcorn tub so that they stick up behind the popcorn bag. 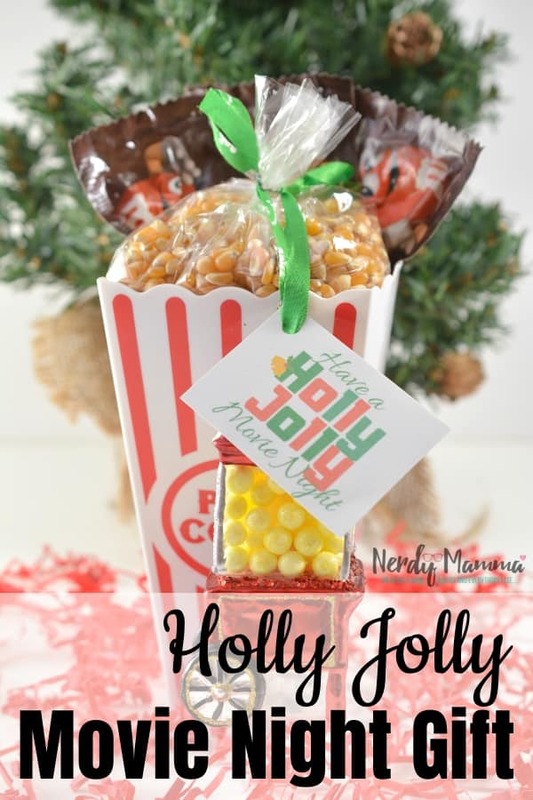 Cut out the “Have a Holly Jolly Movie Night” printable gift tags. Punch a hole in the upper corner of the gift tag. Thread a ribbon or string through the gift tag, and around the holiday ornament. 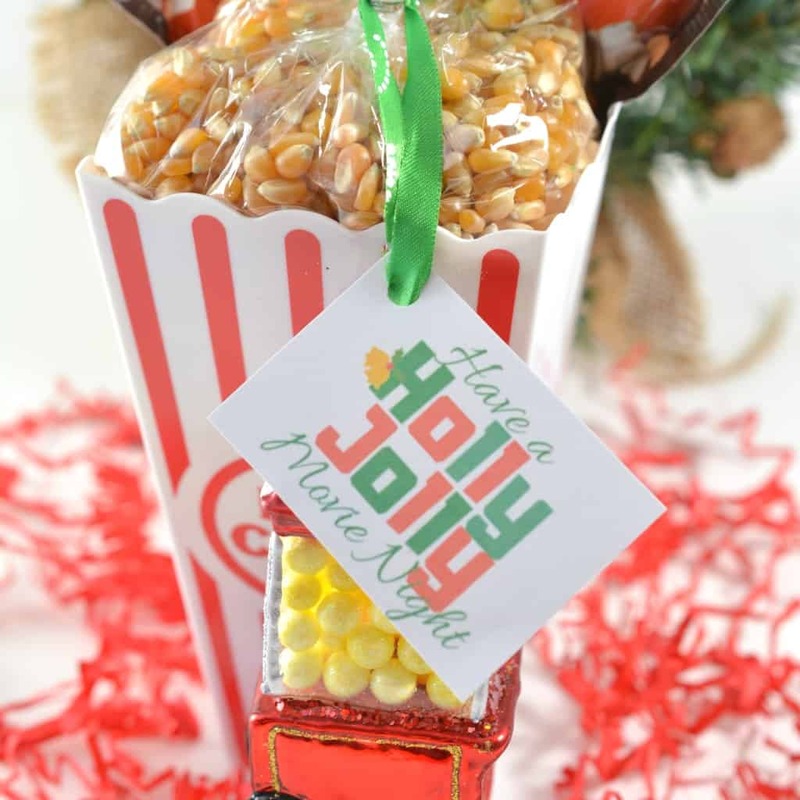 Tie the gift tag and ornament around the top of the popcorn bag so that it hangs down nicely in front of the popcorn tub. It’s so simple! But the result is so awesome. And if you’re still afraid to try it, check out my short video…seriously easy. Now, go ahead and pin this so you can have a chance to gather your supplies, then get your Holly Jolly Movie Night Gift Kit put together for your self friend. You’re They’re gonna love it.